Platinum Bars are a more affordable option than Platinum Coins due to their lower premium above spot price. They are available in a range of sizes from 5g to 1 kilo and the larger you choose, the less you will pay over platinum spot. 1 oz Platinum Bars are the most popular choice for investors and they’re generally supplied in assay packaging with signed certification. 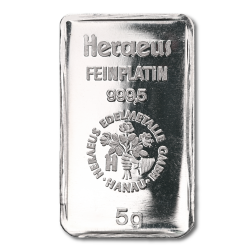 We stock Platinum Bars in various sizes from leading manufacturers like Heraeus. More people than ever are choosing to make platinum part of their pension plan or stock portfolio. Platinum Bars are attractive to buyers for their rarity and purity. Compared with Gold and Silver which have been used to create coins, bars and jewellery for over 5,000 years, platinum is a relatively new option for investors – it was only identified as a separate element in the mid-1700s. Choose .9995 cast or minted Platinum Bars from the world’s most famous brands at coininvest.com - we regularly add to our extensive catalogue of premium Bullion Bars and Coins. Our Platinum Bullion bars are dispatched quickly and all orders are insured for safe shipping to your preferred address.